Every May we travel to San Francisco for Maker Faire. Adam shows some of his products and does a few presentations for his side business. I gather ideas for things I could use in school and soak it all in. Maker Faire is dubbed “the greatest show and tell on Earth” and can be thought of as a state fair-science fair-craft show hybrid. It’s a gigantic gathering of the Maker Movement, a community of makers — artists, authors, crafters, educators, engineers, hobbyists, tech enthusiasts — and technologies of all types. It’s a celebration of invention, creativity, ingenuity, resourcefulness and uniqueness. It is awesome and inspiring, overwhelming and tiring. It is wonderful. 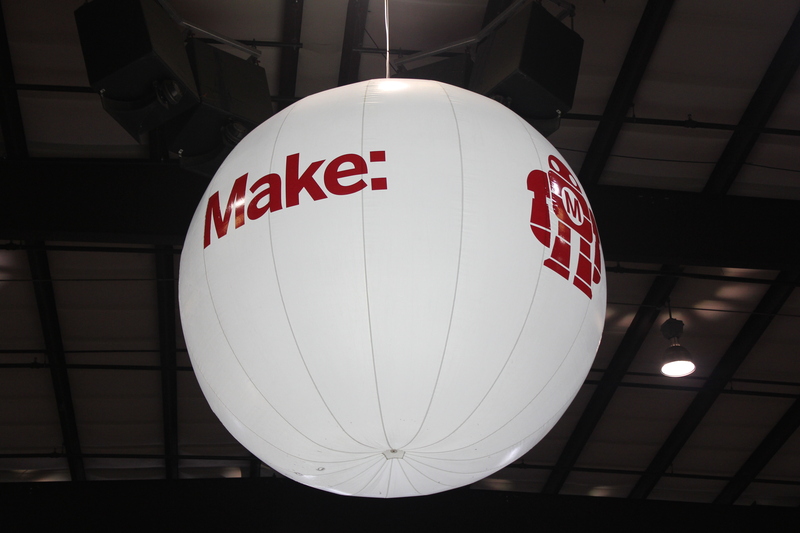 Take a look at the photos below to get a small glimpse of Maker Faire. Remember, everything is made by everyday people. We’ll start with a giant nautilus. There is a viewing deck on top and navigation control in the “belly”. This was able to be driven around the fairgrounds. As it passed by, you heard the pings of a submarine. On Sunday, Adam Savage gave his speech and then did Q&A from the deck. Every year the Life-size Mousetrap makes an appearance. Instead of using a marble and mouse, they use a bowling ball and crash a bank safe onto a car. These animatronic lobsters and fish were mounted to all surfaces of a car. They were programmed to sing in harmony and perform a choreographed “dance” to various well-known songs. Of course, the Daleks of Doctor Who made an appearance as well. This Dalek stood about 10 feet tall and was able to be driven around by a person sitting inside the body. A dancing robot showed up to keep fair-goers in good spirits. He had music booming from the speakers in his chest. The cupcakes are a Maker Faire classic. These too can be driven around using controls hidden inside. This enormous pneumatic hand was controlled through a sensor “glove” that detected and reproduced the wearer’s finger and wrist movements. It was powerful enough to rip a dryer to shreds. And of course there are things for the kids too. This was part of the Minecraft Live exhibit. Many of the popular elements of Minecraft made an appearance in their cardboard forms. Kids could don a “Steve” or “Creeper” helmet, grab a foam weapon of choice, and immerse themselves in the world of Minecraft. This photo shows the exhibit at the end of the fair after enduring two days Minecraft role playing. As you can see, Maker Faire brings all sorts of people together and recognizes creations of all types. Maker Faires and mini Maker Faires are hosted in cities all over the world. I would highly encourage you to check one out if you get the chance.